1 A None No Power Seat 1 A is a standard Business Class seat located at a bulkhead that transforms into a fully-flat bed. The proximity to the galley and lavatory area might be bothersome. 1 D None No Power Seat 1 D is a standard Business Class seat located at a bulkhead that transforms into a fully-flat bed. The proximity to the galley and lavatory area might be bothersome. 1 H None No Power Seat 1 H is a standard Business Class seat located at a bulkhead that transforms into a fully-flat bed. The proximity to the galley and lavatory area might be bothersome. 1 L None No Power Seat 1 L is a standard Business Class seat located at a bulkhead that transforms into a fully-flat bed. The proximity to the galley and lavatory area might be bothersome. 10 A None No Power Seat 10 A is a standard Business Class seat that transforms into a fully-flat bed. 10 D None No Power Seat 10 D is a standard Business Class seat that transforms into a fully-flat bed. 10 H None No Power Seat 10 H is a standard Business Class seat that transforms into a fully-flat bed. 10 L None No Power Seat 10 L is a standard Business Class seat that transforms into a fully-flat bed. 11 A None No Power Seat 11 A is a standard Business Class seat that transforms into a fully-flat bed. 11 D None No Power Seat 11 D is a standard Business Class seat that transforms into a fully-flat bed. 11 H None No Power Seat 11 H is a standard Business Class seat that transforms into a fully-flat bed. 11 L None No Power Seat 11 L is a standard Business Class seat that transforms into a fully-flat bed. 12 A None No Power Seat 12 A is a standard Business Class seat however, noise from the more crowded Economy cabin may be bothersome. 12 D None No Power Seat 12 D is a standard Business Class seat however, noise from the more crowded Economy cabin may be bothersome. 12 H None No Power Seat 12 H is a standard Business Class seat however, noise from the more crowded Economy cabin may be bothersome. 12 L None No Power Seat 12 L is a standard Business Class seat however, noise from the more crowded Economy cabin may be bothersome. 13 A None No Power Seat 13 A is a standard Economy Class seat located at a bulkhead. The seat is classified as a Main Cabin Extra seat that features extra, although stretch restrictive, legroom and may be selected for an additional fee. The tray table and inflight entertainment monitor are installed in a fixed armrest, therefore, seat width is slightly reduced. Floor storage for personal items is not available for use during takeoff and landing. 13 B None No Power Seat 13 B is a standard Economy Class seat located at a bulkhead. The seat is classified as a Main Cabin Extra seat that features extra, although stretch restrictive, legroom and may be selected for an additional fee. The tray table and inflight entertainment monitor are installed in a fixed armrest, therefore, seat width is slightly reduced. Floor storage for personal items is not available for use during takeoff and landing. 13 C None No Power Seat 13 C is a standard Economy Class seat located at a bulkhead. The seat is classified as a Main Cabin Extra seat that features extra, although stretch restrictive, legroom and may be selected for an additional fee. The tray table and inflight entertainment monitor are installed in a fixed armrest, therefore, seat width is slightly reduced. Floor storage for personal items is not available for use during takeoff and landing. 13 D None No Power Seat 13 D is a standard Economy Class seat located at a bulkhead. The seat is classified as a Main Cabin Extra seat that features extra, although stretch restrictive, legroom and may be selected for an additional fee. The tray table and inflight entertainment monitor are installed in a fixed armrest, therefore, seat width is slightly reduced. Floor storage for personal items is not available for use during takeoff and landing. 13 E None No Power Seat 13 E is a standard Economy Class seat located at a bulkhead. The seat is classified as a Main Cabin Extra seat that features extra, although stretch restrictive, legroom and may be selected for an additional fee. The tray table and inflight entertainment monitor are installed in a fixed armrest, therefore, seat width is slightly reduced. Floor storage for personal items is not available for use during takeoff and landing. 13 H None No Power Seat 13 H is a standard Economy Class seat located at a bulkhead. The seat is classified as a Main Cabin Extra seat that features extra, although stretch restrictive, legroom and may be selected for an additional fee. The tray table and inflight entertainment monitor are installed in a fixed armrest, therefore, seat width is slightly reduced. Floor storage for personal items is not available for use during takeoff and landing. 13 J None No Power Seat 13 J is a standard Economy Class seat located at a bulkhead. The seat is classified as a Main Cabin Extra seat that features extra, although stretch restrictive, legroom and may be selected for an additional fee. The tray table and inflight entertainment monitor are installed in a fixed armrest, therefore, seat width is slightly reduced. Floor storage for personal items is not available for use during takeoff and landing. 13 K None No Power Seat 13 K is a standard Economy Class seat located at a bulkhead. The seat is classified as a Main Cabin Extra seat that features extra, although stretch restrictive, legroom and may be selected for an additional fee. The tray table and inflight entertainment monitor are installed in a fixed armrest, therefore, seat width is slightly reduced. Floor storage for personal items is not available for use during takeoff and landing. 13 L None No Power Seat 13 L is a standard Economy Class seat located at a bulkhead. The seat is classified as a Main Cabin Extra seat that features extra, although stretch restrictive, legroom and may be selected for an additional fee. The tray table and inflight entertainment monitor are installed in a fixed armrest, therefore, seat width is slightly reduced. Floor storage for personal items is not available for use during takeoff and landing. 14 A None No Power Seat 14 A is a standard Economy Class seat. The seat is classified as a Main Cabin Extra seat that features extra legroom and may be selected for an additional fee. 14 B None No Power Seat 14 B is a standard Economy Class seat. The seat is classified as a Main Cabin Extra seat that features extra legroom and may be selected for an additional fee. 14 C None No Power Seat 14 C is a standard Economy Class seat. The seat is classified as a Main Cabin Extra seat that features extra legroom and may be selected for an additional fee. 14 D None No Power Seat 14 D is a standard Economy Class seat. The seat is classified as a Main Cabin Extra seat that features extra legroom and may be selected for an additional fee. 14 E None No Power Seat 14 E is a standard Economy Class seat. The seat is classified as a Main Cabin Extra seat that features extra legroom and may be selected for an additional fee. 14 H None No Power Seat 14 H is a standard Economy Class seat. The seat is classified as a Main Cabin Extra seat that features extra legroom and may be selected for an additional fee. 14 J None No Power Seat 14 J is a standard Economy Class seat. The seat is classified as a Main Cabin Extra seat that features extra legroom and may be selected for an additional fee. 14 K None No Power Seat 14 K is a standard Economy Class seat. The seat is classified as a Main Cabin Extra seat that features extra legroom and may be selected for an additional fee. 14 L None No Power Seat 14 L is a standard Economy Class seat. The seat is classified as a Main Cabin Extra seat that features extra legroom and may be selected for an additional fee. 15 A None No Power Seat 15 A is a standard Economy Class seat. The seat is classified as a Main Cabin Extra seat that features extra legroom and may be selected for an additional fee. A window is missing at this location. 15 B None No Power Seat 15 B is a standard Economy Class seat. The seat is classified as a Main Cabin Extra seat that features extra legroom and may be selected for an additional fee. 15 C None No Power Seat 15 C is a standard Economy Class seat. The seat is classified as a Main Cabin Extra seat that features extra legroom and may be selected for an additional fee. 15 D None No Power Seat 15 D is a standard Economy Class seat. The seat is classified as a Main Cabin Extra seat that features extra legroom and may be selected for an additional fee. 15 E None No Power Seat 15 E is a standard Economy Class seat. The seat is classified as a Main Cabin Extra seat that features extra legroom and may be selected for an additional fee. 15 H None No Power Seat 15 H is a standard Economy Class seat. The seat is classified as a Main Cabin Extra seat that features extra legroom and may be selected for an additional fee. 15 J None No Power Seat 15 J is a standard Economy Class seat. The seat is classified as a Main Cabin Extra seat that features extra legroom and may be selected for an additional fee. 15 K None No Power Seat 15 K is a standard Economy Class seat. The seat is classified as a Main Cabin Extra seat that features extra legroom and may be selected for an additional fee. 15 L None No Power Seat 15 L is a standard Economy Class seat. The seat is classified as a Main Cabin Extra seat that features extra legroom and may be selected for an additional fee. A window is missing at this location. 16 A None No Power Seat 16 A is a standard Economy Class seat. The seat is classified as a Main Cabin Extra seat that features extra legroom and may be selected for an additional fee. 16 B None No Power Seat 16 B is a standard Economy Class seat. The seat is classified as a Main Cabin Extra seat that features extra legroom and may be selected for an additional fee. 16 C None No Power Seat 16 C is a standard Economy Class seat. The seat is classified as a Main Cabin Extra seat that features extra legroom and may be selected for an additional fee. 16 D None No Power Seat 16 D is a standard Economy Class seat. The seat is classified as a Main Cabin Extra seat that features extra legroom and may be selected for an additional fee. 16 E None No Power Seat 16 E is a standard Economy Class seat. The seat is classified as a Main Cabin Extra seat that features extra legroom and may be selected for an additional fee. 16 H None No Power Seat 16 H is a standard Economy Class seat. The seat is classified as a Main Cabin Extra seat that features extra legroom and may be selected for an additional fee. 16 J None No Power Seat 16 J is a standard Economy Class seat. The seat is classified as a Main Cabin Extra seat that features extra legroom and may be selected for an additional fee. 16 K None No Power Seat 16 K is a standard Economy Class seat. The seat is classified as a Main Cabin Extra seat that features extra legroom and may be selected for an additional fee. 16 L None No Power Seat 16 L is a standard Economy Class seat. The seat is classified as a Main Cabin Extra seat that features extra legroom and may be selected for an additional fee. 17 A None No Power Seat 17 A is a standard Economy Class seat. The seat is classified as a Main Cabin Extra seat that features extra legroom and may be selected for an additional fee. 17 B None No Power Seat 17 B is a standard Economy Class seat. The seat is classified as a Main Cabin Extra seat that features extra legroom and may be selected for an additional fee. 17 C None No Power Seat 17 C is a standard Economy Class seat. The seat is classified as a Main Cabin Extra seat that features extra legroom and may be selected for an additional fee. 17 D None No Power Seat 17 D is a standard Economy Class seat. The seat is classified as a Main Cabin Extra seat that features extra legroom and may be selected for an additional fee. 17 E None No Power Seat 17 E is a standard Economy Class seat. The seat is classified as a Main Cabin Extra seat that features extra legroom and may be selected for an additional fee. 17 H None No Power Seat 17 H is a standard Economy Class seat. The seat is classified as a Main Cabin Extra seat that features extra legroom and may be selected for an additional fee. 17 J None No Power Seat 17 J is a standard Economy Class seat. The seat is classified as a Main Cabin Extra seat that features extra legroom and may be selected for an additional fee. 17 K None No Power Seat 17 K is a standard Economy Class seat. The seat is classified as a Main Cabin Extra seat that features extra legroom and may be selected for an additional fee. 17 L None No Power Seat 17 L is a standard Economy Class seat. The seat is classified as a Main Cabin Extra seat that features extra legroom and may be selected for an additional fee. 21 C None No Power Seat 21 C is a standard Economy Class seat that may have limited recline. The proximity to the lavatories may be bothersome. Other flyers tend to bump into this seat. 21 D None No Power Seat 21 D is a standard Economy Class seat that may have limited recline. The proximity to the lavatories may be bothersome. 21 E None No Power Seat 21 E is a standard Economy Class seat that may have limited recline. The proximity to the lavatories may be bothersome. 21 H None No Power Seat 21 H is a standard Economy Class seat that may have limited recline. The proximity to the lavatories may be bothersome. 21 J None No Power Seat 21 J is a standard Economy Class seat that may have limited recline. The proximity to the lavatories may be bothersome. Other flyers tend to bump into this seat. 21 K None No Power Seat 21 K is a standard Economy Class seat that may have limited recline. The proximity to the lavatories may be bothersome. 21 L None No Power Seat 21 L is a standard Economy Class seat that may have limited recline. The proximity to the lavatories may be bothersome. 22 A None No Power Seat 22 A is a standard Economy Class seat that may have limited recline. The proximity to the lavatories may be bothersome. 22 B None No Power Seat 22 B is a standard Economy Class seat that may have limited recline. The proximity to the lavatories may be bothersome. 26 A None No Power Seat 26 A is a standard Main Cabin Extra seat that has extra legroom however, the proximity to the lavatories may be bothersome. 26 B None No Power Seat 26 B is a standard Main Cabin Extra seat that has extra legroom however, the proximity to the lavatories may be bothersome. 26 C None No Power Seat 26 C is a standard Main Cabin Extra seat that has extra legroom however, the proximity to the lavatories may be bothersome. 26 D None No Power Seat 26 D is a standard Main Cabin Extra seat that has extra legroom however, the proximity to the lavatories may be bothersome. 26 E None No Power Seat 26 E is a standard Main Cabin Extra seat that has extra legroom however, the proximity to the lavatories may be bothersome. 26 G None No Power Seat 26 G is a standard Main Cabin Extra seat that has extra legroom however, the proximity to the lavatories may be bothersome. 26 H None No Power Seat 26 H is a standard Main Cabin Extra seat that has extra legroom however, the proximity to the lavatories may be bothersome. 26 J None No Power Seat 26 J is a standard Main Cabin Extra seat that has extra legroom however, the proximity to the lavatories may be bothersome. 26 K None No Power Seat 26 K is a standard Main Cabin Extra seat that has extra legroom however, the proximity to the lavatories may be bothersome. 26 L None No Power Seat 26 L is a standard Main Cabin Extra seat that has extra legroom however, the proximity to the lavatories may be bothersome. 35 J None No Power Seat 35 J is a standard Economy Class seat however, other flyers tend to bump into this seat. 36 A None No Power Seat 36 A is a standard Economy Class seat that may have restricted legroom due to this seat being misaligned with the row in front. 36 C None No Power Seat 36 C is a standard Economy Class seat that may have restricted legroom due to this seat being misaligned with the row in front. 36 J None No Power Seat 36 J is a standard Economy Class seat that may have restricted legroom due to this seat being misaligned with the row in front. 36 L None No Power Seat 36 L is a standard Economy Class seat that may have restricted legroom due to this seat being misaligned with the row in front. 38 A None No Power Seat 38 A is a standard Economy Class seat that may have limited recline. The proximity to the lavatory may be bothersome. 38 C None No Power Seat 38 C is a standard Economy Class seat that may have limited recline. The proximity to the lavatory may be bothersome. 38 J None No Power Seat 38 J is a standard Economy Class seat that may have limited recline. The proximity to the lavatory may be bothersome. 38 L None No Power Seat 38 L is a standard Economy Class seat that may have limited recline. The proximity to the lavatory may be bothersome. 39 D None No Power Seat 39 D is a standard Economy Class seat however, the proximity to the lavatories may be bothersome. 39 E None No Power Seat 39 E is a standard Economy Class seat however, the proximity to the lavatories may be bothersome. 39 G None No Power Seat 39 G is a standard Economy Class seat however, the proximity to the lavatories may be bothersome. 39 H None No Power Seat 39 H is a standard Economy Class seat however, the proximity to the lavatories may be bothersome. 4 H None No Power Seat 4 H is a standard Business Class seat that transforms into a fully-flat bed. 4 L None No Power Seat 4 L is a standard Business Class seat that transforms into a fully-flat bed. 40 D None No Power Seat 40 D is a standard Economy Class seat in the last row of the plane that may have limited recline. The proximity to the lavatories and galley may be bothersome. 40 E None No Power Seat 40 E is a standard Economy Class seat in the last row of the plane that may have limited recline. The proximity to the lavatories and galley may be bothersome. 40 G None No Power Seat 40 G is a standard Economy Class seat in the last row of the plane that may have limited recline. The proximity to the lavatories and galley may be bothersome. 40 H None No Power Seat 40 H is a standard Economy Class seat in the last row of the plane that may have limited recline. The proximity to the lavatories and galley may be bothersome. 5 A None No Power Seat 5 A is a standard Business Class seat that transforms into a fully-flat bed. The proximity to the galley and lavatory area might be bothersome. A window is missing at this location. 5 L None No Power Seat 5 L is a standard Business Class seat that transforms into a fully-flat bed. The proximity to the galley and lavatory area might be bothersome. A window is missing at this location. 7 A None No Power Seat 7 A is a standard Business Class seat that transforms into a fully-flat bed. The proximity to the galley and lavatory area might be bothersome. A window is missing at this location. 7 D None No Power Seat 7 D is a standard Business Class seat that transforms into a fully-flat bed. 7 H None No Power Seat 7 H is a standard Business Class seat that transforms into a fully-flat bed. 7 L None No Power Seat 7 L is a standard Business Class seat that transforms into a fully-flat bed. The proximity to the galley and lavatory area might be bothersome. A window is missing at this location. 8 A None No Power Seat 8 A is a standard Business Class seat that transforms into a fully-flat bed. 8 D None No Power Seat 8 D is a standard Business Class seat that transforms into a fully-flat bed. 8 H None No Power Seat 8 H is a standard Business Class seat that transforms into a fully-flat bed. 8 L None No Power Seat 8 L is a standard Business Class seat that transforms into a fully-flat bed. 9 A None No Power Seat 9 A is a standard Business Class seat that transforms into a fully-flat bed. 9 D None No Power Seat 9 D is a standard Business Class seat that transforms into a fully-flat bed. 9 H None No Power Seat 9 H is a standard Business Class seat that transforms into a fully-flat bed. 9 L None No Power Seat 9 L is a standard Business Class seat that transforms into a fully-flat bed. All seats feature a 15.4-inch HD-capable touchscreen monitor with a selection of up to 75 movies, more than 150 TV programs, More than 350 audio selections, and up to 15 games. Every Main Cabin Extra and Economy class seatback has an 8.9-inch HD-capable touchscreen monitor with a variety of movies, TV programs, games, and audio selections available. All classes of service on this aircraft feature regular AC power. Food service depends on route, length of flight, and time of day. Business passengers are offered premium dining. Main Cabin passengers on long-haul international and certain US transcontinental flights are offered complimentary multi-course meals. Sandwiches, wraps, and snack boxes are available for purchase in Main Cabin on other flights (US domestic, Canada, Caribbean, and Mexico). Non-alcoholic beverages are complimentary on all flights. Beer, wine, and a variety of spirits are complimentary in Business and Main Cabin Extra on all flights. They are complimentary in the Main Cabin on certain long-haul international flights and may be purchased on flights where they are not complimentary. This aircraft is used primarily on long-haul international services in addition to a few domestic routes. In the Main Cabin each seat features an individual entertainment system however underseat space at all A, J, and D seats is limited due to an equipment box beneath the seat. A word of warning - the herringbone configuration in these American 700-200 Version 1s is truly awful. The seats are joined and if your adjoining seat is occupied by a larger person you will feel their every movement and sleep will be difficult or impossible. I experienced this on no less than 3 flights on a trip recently all in seat 2A - AA135 LHR-LAX, AA102 HNL-DFW and AA78 DFW-LHR. There are a limited number of 'unjoined' seats not affected by this including 1A but this was reserved for crew rest. Will never fly this configuration again on an American 777 and will stick to 700-200 v2 or 777-300 !! I'd like to write a strong complaint for my experience from Flight 142, with regards to legroom/space on this Boeing 777-200. I had no problem with the flight, food, entertainment, or the service on board. It was strictly the legroom that I have found very appalling and quite degrading. I have flown this route for years, including this specific Boeing 777 aircraft, (between JFK and LHR, as I was also a London resident from 2011-2017). As soon as I sat down in my seat at 32A, I immediately felt the difference from my previous flights on this aircraft (whether it was the B777-300 or the B777-200). The tray was touching my stomach, and I had no legroom/space to the point that it actually hurt my back to crawl over to get my bag/carry-on that was under the seat in front of me. In addition, I noticed the seats itself were smaller. My flight back to the US (LHR to PHL to ISP) was a much better experience, as I had flown the Airbus 330. As soon as I sat in my seat at 12H, immediately I felt the difference, as my flight back to the US was much more comfortable and standard for the economy cabin (although the entertainment system needs a boost here!) As I loyal AAdvantage member since 1988, I am extremely disappointed with what is happening with the airlines, with respect to reducing leg room on certain aircraft in order to fill more seats for financial profit. American Airlines is one of the top commercial carriers in the world, and I would expect more from this airline, not to be reduced to a sardine packed in a can like cattle. I often fly both the B777 and B747 with British Airways and American Airlines to London. Since 2011, this was the first time I have experienced such discomfort. Perhaps they are slowly recalling specific aircraft to add more seats thereby reducing leg room for the economy passengers. As I will continue my travels to London, I now have to be aware of which aircraft to book. Sadly, this exact flight works for me, as it's the only AA day flight from JFK to Heathrow. Why should I have to pay more money to have a better seat in Economy, just for a few more inches in front of me? Is this the direction that American Airlines will take w/all their long haul aircraft? I slept great in this seat. Overnight, nonstop. I am 5'4" 125lbs. My feet had plenty of room even with my large purse there. The seat reclined just right for me & the seat in front of me did not bother me. The entertainment screen was good with a lot of choices. I wish I had a sleep mask to darken even more & will have one next time. I have been traveling to Paris for many years and the 777-200 Version1 aircraft was the most uncomfortable business class I have flown. The seats were uncomfortable, one felt terribly confined and there was no storage space...this contrasts markedly with Version 2 which we took over on flight 62. Furthermore, the oxygen content was low causing breathing discomfort, I told one of the flight attendants that I hated the aircraft and she replied "I do too!" Head to toe arrangement is bizarre and they need another trip to the design shop. Version 2 which we took on September 13, 2018 was much better. Both flights were Miami - Paris and the return. I recommend avoiding taking this plane, especially when the prices are running between $7000 and $12,000 RT. If you have to make sure to get the forward facing seat(s). Service was good, better than usual for American Airlines. This seat has great legroom but it's hard to enjoy as carts and restroom users regularly will knock in this seat on their way to the back of the plane. For a MCE seat, this is a disappointment. Yes, there is additional legroom and the bulkhead means that you can get past your seatmates without having them get up, but the misaligned window meant that one shoulder hit the exterior wall while the other was on the person to the right. The tray table which is in the armrest is so small, and so close to your body and you are so close to your neighbor that all your dining has to be done with great care. Even the flight attendant was worried about my ability to manage the red wine served with the meal. The pros of this seat: plenty of room. You only have one seat mate and the seat itself sits quite a ways from the wall. The white noise drone of the engine helps with noises that would normally wake me up. It seems as more people use the middle bathrooms, rather than the back as it was always free when I went to use it. I would definitely sit in this area of the plane, BUT this seat doesn't give you the wall to lean against when sleeping, you have a big gap. Having the wall is the trade-off in my mind to taking an inside seat. Fortunately, I had a great seat mate who always hoped up to let me out. The worst would be trapped with a sleeping seat mate. Traveled in the updated 777-200 DFW-HNL on 3/10/18. Configuration was 36 Business, 24 Prem Economy and 212 Main Cabin Extra/Main Cabin. 17a, 17b, 17j, and 17l are ideal seats due to no center seat attached. More legroom and you can store stuff under the seats in front of you that are divided by a partial partition separating Prem Economy and Main Cabin. It is a little more narrow that the seats behind but I would glady take this due to the fact there is no center seat. Row 17 goes 2 - 4 - 2. Row 18 and most of the other rows go 3 - 4 - 3. Plenty of room to stretch and also room to put your stuff on the ground in front of you. The recline on the seat is good. The seat pivots at the base to kind of cradle you. I actually had a Prem Economy seat on the way back (14g) and it only reclined. There were foot rests for that one. In all honesty I preferred the seat 17a. IFE was great! Lots to choose from. I took this plane both directions on a trip from MIA to Madrid. All seats faced forward. It is very difficult to speak with travel companions because of the way seats are angled and separated by high walls. Middle seats cannot see out windows. Window seats in Business are a higher row number than the seats next to them in the middle. I was in seat 4A and my friend, who was in seat 4C was actually one row further back than me. The seat was comfortable enough while reclining, but it was not comfortable for sleeping when flat. Bose headsets were great. Movie selection was extensive. Service was excellent. The food was surprisingly good. It was a pleasant flight in both directions. The only seats that I would avoid in this cabin are rows 5 & 6. There was an equipment change from the 777-300ER to this aircraft on my LHR-LAX flight. I was the last person upgraded to business and ended up in this seat. While I will always take a biz seat over an MCE seat on a long-haul, this seat is very strange. 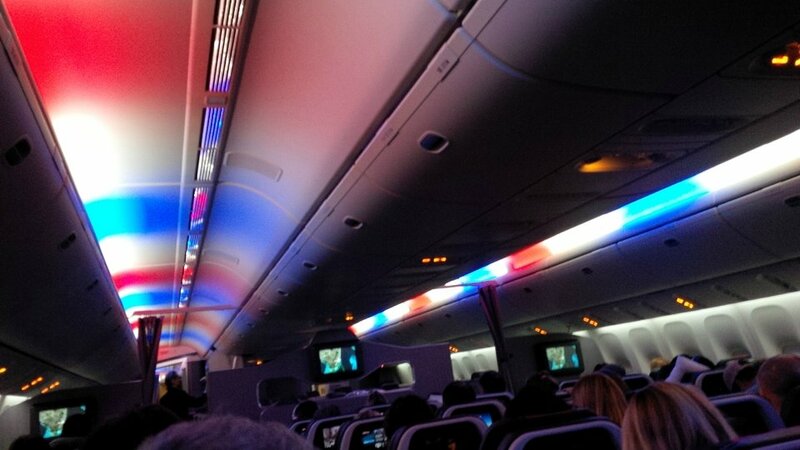 It was a daytime flight, so not a lot of sleeping and the cabin lights are fully on. I spent the full 11 hours staring into the faces of the people in the first row of MCE. Even while watching the Entertainment screen, I could still see them. It was very strange to feel like I was being watched while eating meals or having a glass of wine. This row directly in front of the center bulkhead is a raging thoroughfare for over indulgent drinkers crossing to the other side of the plane looking for vacant lavatories. Impossible to stretch out legs or get any sleep on a long haul. These seats cost more than regular coach seats! Nightmarish flight! Passengers should not have to make way for passengers from outside their own row, especially for the whole duration of the flight! While there is legroom, this seat has the bulkiness of the emergency exit door so you cannot stretch straight... you have to stretch diagonally. Also I found this seat to be very cold because I was leaning on the wall of the fuselage. I swapped seats from 27G to 29C thinking they were the same. They are NOT. 27 G had 1-2" more legroom. In fact I recall at check in, I was offered to "buy 27H for $149" which suggests AA knows that section is more desirable. This Zodiac configurations received a lot of bad rap. Not all of it is justified. By choosing seat 12a or 12l you can avoid the cross vibration problem, because these are the only forward facing seats not completely connected to the rear facing seat. Overall, this plane is not as cool as the AA 77W, but a hundred times better than the old J configuration. This must be an updated Business Class cabin. The seat is more comfortable than the BC seats on Delta, which I normally fly overseas. The seat controls take some getting used to as do the entertainment system controls. Finally there is a decent size screen! I'm not a fan of riding backwards, so if that's important to you make sure you select a forward facing seat. For anyone over 6ft tall , these seats are a must . Travelled in standard economy on return flight & was most uncomfortable , not only on legroom , but seat width also . I will pay $100 or more to fly an airline on the route I need to avoid the inhumanity of the new 777 layout with 10 across seating. It was built to be a 9 across plane for a reason. Even an A330 is more comfortable. This plane is quiet with a very smooth ride. MCE has great legroom, and I appreciated the personal IFE. With that said, I found the seat itself to be very uncomfortable for 7 hours. I was not able to sleep well, and our lower backs hurt a lot at the end of our flight. Wow! I loved this seat on a trip from JFK to LHR. 1A is positioned more to the back of the plane than are seats 1D and 1H, so it becomes very private and quiet. You do not experience the movements of passengers abutting the seat, like you will read in reviews about other business class seats. Yes, there is a galley and restroom in the forward section of the plane, which might make you think it would be noisy. But, the galley is not used for food preparation. And the restroom is separated from the back of 1A by a closet. Most passengers tend to use the restrooms at the back of the forward business class section anyway. I recommend 1A and consider it to be the best on the plane. Decent seat in a well maintained airplane. Seemed room available was more than the stated 31". Comfortable for a 9 hour flight. I know many people avoid the rear of the plane, but there are some great benefits to this aisle seat. Because you are in a row of 2 with a row of 3 in front of you, you have access to two seat back pockets as well as elbow room to your left, plus no refreshment carts brushing up against your left side. I found it fairly comfortable for an economy seat. Flew from Narita to DFW on this aircraft on April 16th 2017. Comments about passenger congregation 'in your space' are valid. The emergency slide will block your feet and force you into an uncomfortable position. Considerably better than the rest of coach. AC power did not work at all for any seat on my aircraft, multiple plugs tried. This may be a fluke to that particular aircraft as I have successfully gotten power on a JAL 787-8 (operated by AA) and an ANA 787-9 (operated by United). Solid flight crew on this trip - no issues. Comfortable business class seat, far from galley and lavatories...forward facing pod, lie flat good for napping, nice pillow and quilt. This is last row of business but no issue with noise from main cabin. Good AV functionality, good power for electronics. Good seat. Although I've read that the rear-facing seats on the 777-200 have privacy screens that cannot be lowered, that isn't the case on this flight. For my trip from London to Miami I had a seat 29E. However, the plane was half empty and i had a whole row to myself and my boyfriend. The journey was very nice and not cramped at all. Overall location is fine as you have bathrooms close to you but not too close. Flew transatlantic to New York / Kennedy on this aircraft. Our assigned seats 1D and 1H were rear facing and have a privacy screen that cannot be lowered. Before departure we could move to forward facing 2D and 2H where the privacy screen is permanently lowered which, for us as a couple, was better. Almost empty business class, kind crew and meals and no complaints. I found this rear-facing seat very pleasant. Everything worked and i could sleep. Big screen + noise-cancelling headphones were very nice. Food service fine but drink selection limited. Seat did move if my neighbor bumped the wall, it shook but not too bad. I DESPISE the business class seats on this plane. It appears as if the seats that are directly ahead/behind of each other are connected somehow. Thus, EVERY SINGLE TIME the person behind you moves, sits down abruptly, you will feel it. Terrible design. All of the rear facing business class seats have a wall divider that will not lower. Avoid if travelling as a couple. WARNING! seats 5D and 5H are not together. There is a partition between them that is locked upwards. You are better off flying separate in window seats or on the forward facing seats. Seat 21K is the worst airline seta i have ever had. Simply horrible. Im a 5'10" female, and the seat offered very limited legroom. My knees touched the seat in front of me for the the entire flight from London to Miami. I was travelling for business and planned to work on my laptop during the flight but wasn't able to due to the cramped conditions. My knees hurt and feet were swollen after the flight. IT WAS THE MOST AWKWARD SEAT LAYOUT I HAVE SEEN IN MY MORE THAN 50 YEARS FLYING BUSINESS AND/OR FIRST CLASS. ABSOLUTELY HATED THE SCREEN BETWEEN THE MIDDLE SEATS D AND H MY HUSBAND AND I COULD NOT EVEN SEE EACH OTHER LET ALONE TALK OR ENJOYING DINNER OR COCKTAILS - WE WERE TOLD SCREEN NEVER GOES DOWN. ANGLE SLEEPING VERY UNCOMFORTABLE IF YOU WANTED TO GET UP IN A HURRY YOU WILL CERTAINLY BE TRAPPED. IN GENERAL THE WHOLE SET UP IS CLAUSTROPHOBIC. It was OK. Absolutely no view outside. I am 6'2" and didn't quite fit. Felt like my feet were being pushed together when I tried to sleep. The whole arrangement seems a little awkward. If flying by yourself, get a window seat. Would be much better. There are some derogatory comments regarding the business class seats on the reconfigured 777-200 (version 2 on this site)where there is no first class but an expanded business class. I found my seat 5D (a rear facing seat in the front cabin) to be very comfortable but the one point I will agree with is the transmission of movement from the linked seat (4D in my case). Any time the occupant moved or got up/down my seat shook and shuddered with their movement. Really quite poor for such a newly renovated seating layout. The seat adjust ability is also somewhat limited but I did not find the seat uncomfortable. I am 6'2" and had no issues sleeping stretched completely out. The IFE is also very good with a large hi-def screen and excellent range of programs to watch. The service was typical US carrier standard - a little disinterested but prompt and of reasonable quality. I also had some noise transmission from the galley in this seat - this is one area that US carriers are hopeless on - they all bang and clatter in the galleys with little regard for those customers that are seated near - get away from the galleys when you can. If two are flying together in Business Class, the only "adjacent" seats are rear facing center seats in rows 1,3,5,8,10,12. I was very disappointed in the room of the lie flat bed. I am 6'3" and my head and feet both touched, and the foot area was so narrow that I had to cross (stack) my ankles. This seat had nice space as a bulkhead I could get up and not disturb the other passengers. The entertainment system was also pretty good although it was not in very good shape in terms of slipping down and its stowed below which is awkward. The flight overall was very good but some of the onboard staff was surly which is quite a change when dealing with UK airlines where the staff is very friendly. US airline staff definitely seem to have morale problems although some of them were friendly. Overall it was very comfortable, with a nice view out the windows. I agree with others' comments that when the person in the seat behind me moved, it shook my seat as well. Also, providing no small storage cabinet which other airlines seem to have in similar kinds of seating is a real miss. There is a small "pocket" to put your cellphone in while charging, but it cannot stay there during landing & take off so it's not that convenient. Flew LHR to JFK daytime flight. It helps that this part of the cabin is 3-3-3, it is less cramped than 3-4-3 in the back. Middle seat so window view is not great but still visible. IFE was very extensive and sharp, and no annoying entertainment loop like AA of the past. New seat felt comfortable and roomy for economy, compared with others. Would definitely fly this aircraft again. The rear facing middle seats in business class are ideal for passengers traveling together. The heads are closer to one another especially when you put the divider down. While the bed aspect of the business class seats is comfortable when flat, the overall space, layout, and controls are poorly thought-out and do not seem to have been user-tested. As others have noted, the partitions btwn middle seats are fixed in UP position, so there is no way to travel next to a companion and actually communicate. (The best option would be to face each other in backward-forward seats across the aisle -- but then you are still across the aisle at some distance.) The seat space is over-designed but offers almost NO storage and feels quite cramped. The seat controls offer little real control. For example, you cannot lift the leg rest independent of reclining the seat. When you have the seat partially reclined, it is very difficult to get out of b/c it has moved forward in the process of reclining. There is no back support control, as you find on BA or Qatar flights. The "suite lights" control didn't do anything. Our flight attendants had not been trained on the plane, so they did not all know that forward-facing business class passengers were supposed to put on the (uncomfortable) shoulder strap for take-off and landing. We were shown the shoulder strap only upon landing. I have no issue with backward-facing seats, and would happily take the better-established BA business class layout over this clunky AA attempt. Not a comfortable location and not worth a paid upgrade. The row is narrower than other Main Cabin Extra rows by quite a bit. Combined with tray table and video in the arm rest the seats are very narrow. I would avoid 13 A,B,C and J,K,L. I am not sure of D,E,F. The seat in front is narrower so the TV is not lined straight ahead of you but at a slight offset. I was switched onto this flight at the last minute and asked for a window seat. Unfortunately, the only window at this rear-facing window-seat is behind the passenger's head. So, while a person could open or close the shade with some difficulty to control ambient light, it would be virtually impossible to look through the window. Flyer beware! Seat 13a definitely has more legroom been a main cabin extra seat - but the bulkhead extends all the way to the floor - so you cannot stretch your legs under the seat in front. Plus the armrest is fixed, which means if your lucky enough to have a spare seat next to you (as I was) you cant really use it. MCE makes all the difference in this plane. BCN-JFK was easy and comfortable. Definitely NOT worth the upgrade fee , The rigid armrest cannot be moved making this seat very narrow for a 6'2" medium frame man. The extra leg space is not without toll. People constantly come across and step on your belongings since there is no where to put your stuff. Nice new seats and entertainment system. With usb and ac power. Ample leg room. 1 L was really noisy. Lots of banging of carts halfway through the flight and this was where the flight crew eats and chats. Stick to the middle of either business cabin if you want to sleep. And 1 L seemed shorter than the other business seats. I strongly disagree. You are doing your users a disservice by stating this is a standard Main Cabin Extra seat. I flew from JFK to CDG on May 27, 2016. Window seat 13L is not at all comfortable when the middle seat is occupied. I found myself with limited space. The proximity of the seat to the window wall did not allow me to lean to the right. I was not able to lean to the left because the middle seat was occupied. I was left with too little space to comfortably place my arms for the entire flight. I fly transatlantic round-trips once per month on AA. This was the worse seat that I have every had. I paid $150 for "preferred seating" for my husband and I to sit together on the these seats which were in the 2-5-2 economy class configuration on the Boeing 777-200 version 1. At the last minute, AA changed aircraft to the Boeing 777/200 Version 2 and we found that seats 21A and 21B were suddenly in the 3-3-3 configuration near the toilets. My husband was suddenly in a middle seat. NOT NICE!!! I sat in 14C for a day flight from LHR to JFK. Very comfy, lots of legroom. Seemed to have more legroom than row 13 since they have a wall in front of them. Plus, they can't lift up their armrests in row 13. I sat in 1H for a JFK/LHR overnight flight. I was right by the galley and it was used for service but since I was sleeping and had my bose earphones on, it wasn't a big deal. When I was awake, there was a bit of traffic up there with all of the FAs, but otherwise, no big deal. The worst part was looking right at the person in 1L... a bit awkward. I didn't feel the people around me moving so either they weren't big movers or the fact that I was in a rear facing seat and my head was against an actual wall gave my seat stability. Flew LHR-DFW, and seat was relatively good, though felt smaller than business class on the 777-300 (77W). I'm guessing the front/back configuration allows them to pack more seats in. Rear facing feels a bit odd, and as others have mentioned, there's only one window which is pretty much behind the seat. If you want to try looking outside, you have to turn your head about 135 degrees. Really isn't that close to the lavatory, so no concerns there, no bumping or shakey neighbor to be concerned about. Given it was a daytime flight, I worked the whole time and didn't sleep. I was very impressed with the amount of workspace and the size of the fold-out table. I was able to have my laptop, a travel second monitor, a mouse, and an A4 stack of documents all laid out comfortably. While I didn't sleep, I did recline the seat for a bit at the end of the flight to test it out, and at 6'1", I just barely fit. I mean I could probably sleep comfortably on my side with my legs slightly bent, but when completely stretched out, both my head and feet were touching the walls. Can also confirm for the center seats: forward-facing seats, privacy partition is fixed in down position; however, it's not that bad as the console is between you so you're not really face-to-face. Rear-facing seats, partition is fixed in up position. Recently flew from LHR to JFK on this plane. More comfortable than business class seats on BA or Delta, both of which I have flown on this route. Agree with comments that the seat shakes when person occupying attached seat moves. Wifi works well. The shoulder room in this particular seat is limited due to the alignment of the seats to the windows. 14a does not have the same problem. This 11 hour flight from JFK to EZE was wonderful. The flight staff were friendly, the food very tasty(hard to believe for airplane food)and the seat comfortable. I sat in 3L forward facing and husband was in 4L. We each chose to have a window seat. New seats are a vast improvement over the previous lie-flat. Not sure why AA chose not to put the same (Zodiac?) seats from their 777-300ER's on to these planes & 787's. These seats are not as private and downside is that they are attached in groups of two so if the person next to you moves around a lot, you do too. I'm not someone who tosses around a lot when trying to sleep but if you're seated/trying to sleep next so someone who is, that will annoy you. Otherwise, the seat is great, not as solid or private at 300ER though. The backwards seats are a little strange and hard to get used to. Different than the BA seats in which you are completely backwards, these are at an angle which is better than completely backwards. And you do have a wall in between you and your seat mate vs. BA. Much better product. Flight attendants and their attitudes is still a toss up - sometimes you win, sometimes you lose! Seat was very comfortable. Finally AA did something right with their planes inside. My previous flights from Miami to Europe were not very pleasant since the planes were old and the seats never reclined 180. It was a midnight flight from Buenos Aires to MIA Feb 29 2016. Drafty, cramped and could not even have rested my head down on the tray table if I had wanted to. I am so fed up with the scrimping and scavenging of inches at the loss of passenger comfort. American, it is your dollar loss. Seat with enough legroom, nobody in front of you. Because they block seat 13D and 13E there is a good chance that you have the whole row for yourself. There is a lot of legroom for row 23. The exit doors stick out in front of the bulkhead seats (23A and 23H). I was able to put my feet up on the exit door (the crew didn't say anything) and had a nice nap on the overnight flight. I'm 6'1". However, a lot of people congregate near the lavatories, making seats 23C and 23J less nice. Is the best seat in the BUsiness Cabin but dont have too much space to keep your baggage. The space is occupied with the life jackets and other things of the crew. The front galley is not used to prepared the meal,so nobody is there making noise. While not MCE, it had more legroom than expected, and unless you're over 6'1", I don't think you'd have a problem. What makes the seat better is in this cabin it is still 3-3-3 seating, which means wider seats, and wider aisles for more comfort. The aft cabin is horrible, so if you can't get MCE, you still are ok in these seats. And the IFE is more extensive I believe than 773 version. The seat (like all other AA main cabin seats, I believe) has the exact leg room for me. If I tried to store a toiletry bag in the seat pocket, I just couldn't move my knees, as they became stuck (and I'm just 5'9"). Besides that, this seat is too close to restrooms. Positive points are: very good entertainment system, power plug and USB plug in every seat and a "private" narrow overhead bin just over ths seat. This seat may be somewhat undesirable if you like to enjoy the view outside because it only has one window and it's almost behind the seat. I am 5'9 and i could just barley touch the wall. I would say those that are 6ft should find another seat. Or grab this one or the other isle seats in this row, you can put your legs in teh isle becuase there is no galley in gront of this section. Just a divider between first and MCE. So the crew doesnt cut through this area. I really enjoyed the seats on this plane. However, it should be noted the privacy partition is set in an UP position, so if you're travelling with a companion you can barely see them during the flight unless you peek over the top. The Flight Attendant did say that AA was working on a solution to have them adjustable. The privacy partition in the odd rows in the first section of business class do not lower - they are fixed in place. The even number seats have the privacy partition fixed in the lowered position which means no privacy from adjacent seat. American Airlines flies 2 versions of Boeing 777-200.